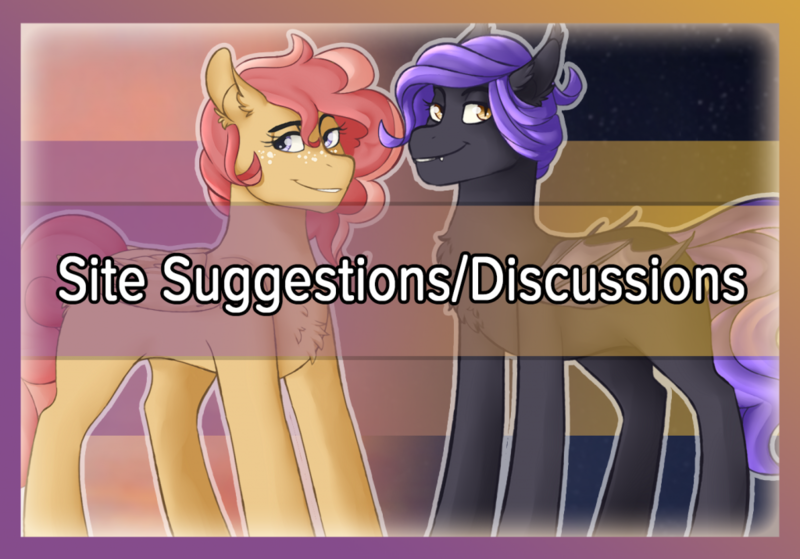 Info » Canterlot Avenue Site Suggestions/Discussions » Canterlot Avenue | The Roleplay & Social Site! This is a page for users to get in contact with staff to come up with suggestions and offer a place onsite to discuss what features the website should add for the future that may be help improve the user experience. As this is a page for suggestions we'd also ask that discussion remain on topic and refrain from excessive derailment of posts. We’ll try to get to everything sent to us here but forgive us if we miss yours, feel free to ‘bump’ a post if it goes more than two days without a response from one of us. We’re more than open to negative feedback but we do ask that discussions remain civil and avoid attempting to call out users or staff members explicitly. At the moment it's being run by Jubilance and the rest of the PR team, please bear with us as we try to work with you. NOTE: Please make sure that if you are posting a suggestion, to double-check that it has not been suggested already. Please refrain from posting troll suggestions. Just a brief reminder that discussion should be kept civil at all times! We're here to help. what would count as an troll sugestion?